Thanks very much, Thijs. That map completes the journey beautifully. 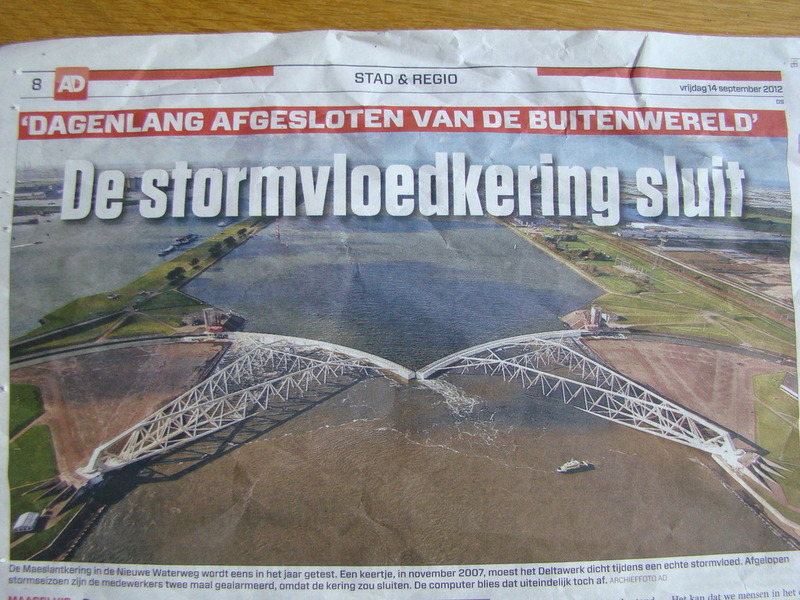 I can go back to studying the Haringvliet Barrier this afternoon! I can't overlap my two images, the angle is wrong for the rest of the panorama. It didn't work. red arrow point the P&O ferry terminal. A.it's gonna be a long long long walk,more than 200 km,and i hate long walks. B: Not too much me either... anymore. Well, apart from an occasional Dry Martini. To follow #512 I have been preparing a special post to end with, celebrating what was a special time for me. But the atmosphere has, sadly, been broken. So instead I will just express my heartfelt thanks to you, Thijs, for the thoughtful planning and preparation that went into making my time in the Netherlands last June such an exciting, enjoyable one, full of surprises and fun. Thanks also for the hard work you have done in copying and translating pages from your books to show the story of much that went into the construction of the Delta Works. That, together with the actual day's exploration of the area, has fulfilled a long-held wish to find out more about this great achievement. Those pages and your maps will be printed out and put in my folder together with last year's maps of Woerkum. But my excitement in finding that we were going there did not eclipse that at seeing all the other places, from Woerkum (which I have come to love) to Dordrecht to Zaanse Schans, from the Highway Cruiser to the Janihudi, and the unforgettable ship-chasing! Definitely shaken.... and perhaps even some fruit-Martini... my favorite is Mango-Raspberry! i just got some of like the same images but from the other door. also from the newspaper the shedule of closing the doors,which a few weeks back had a test closing. i was enyoing it too Ivy,glad to be a help for those day's. Then post them by all means, Thijs. the last iages a have of the delta works. are laying day after day useless at the side of the ''new waterway''. but further they waiting on a storm that statistical happens ones in 10 years. already for days there is a arrival for a big storm. pushed by a northwest storm treathens a enormes big watermass to the dutch coast,but the computer of the maeslantbarrier keep themselves quit . she never stores earlier than 24 hours in advance alarm and not later then 16 hours against a stormflood. 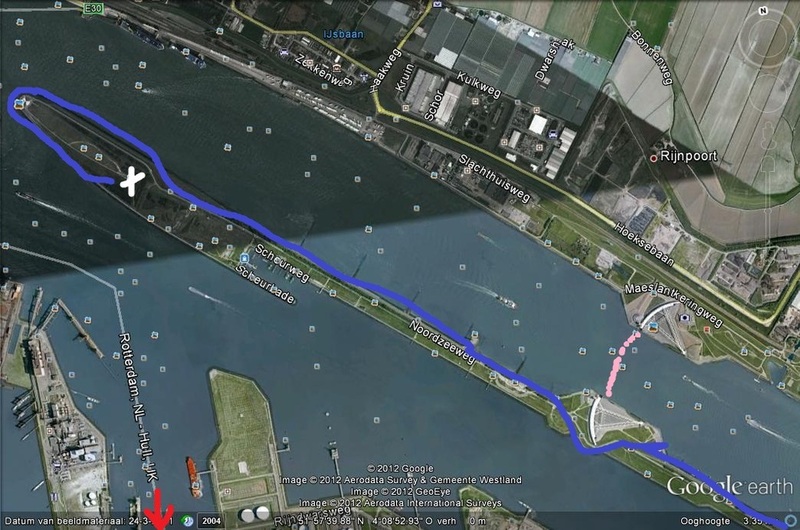 only then the computer can well calculate when the waterlevel at Rotterdam comes above 3 meters above NAP. information about the superstorm she get from measuring equipment at sea. the staff of the deltawork gets a call at there pieper. during storm season ,from 1 oktober untill 15 april,theyhave to carry them always. they got 2 hours to get at there post. a vacation far away is not gonna happen. in the rolbook stands what the staff have to do. beds have to made up and food have to get ordered for 3 days. we have to be prepared that we are close out from the outside for a longer period. by windforce 13 trucks blown over and the highway arround Rotterdam could have jammend. we have to operate depends the chaos. every post is dubble occupied ,so that they can 1 for the other can sleep and work. thats prevent that ''pots viewers'' (curious viewers) come to look at the barrier. on the ''landtong'' at rozenburg 5 people. crisis situation or not. ''offourse if the barrier is closing we also like it,this is where it's ment for''. the computer calculate every 10 minutes over the ,the exspecting flootwave. everyone is looking tenshed to the screens,the time of closing can change by evry new claculate. the dicide team have a meeting within every 3 hours. the differend leaders looking at the situation. they get the help of a supporter ,meanwhile a monitor is looking if everything is done by the book. which have to look if there was stepped away from the protocol. importents discusion:did the computer that he had to do? the expirience have learned thatcomputers are not flawlessly. people have to check them. and that people got to have the last word. ther goes a warning to the shipping. 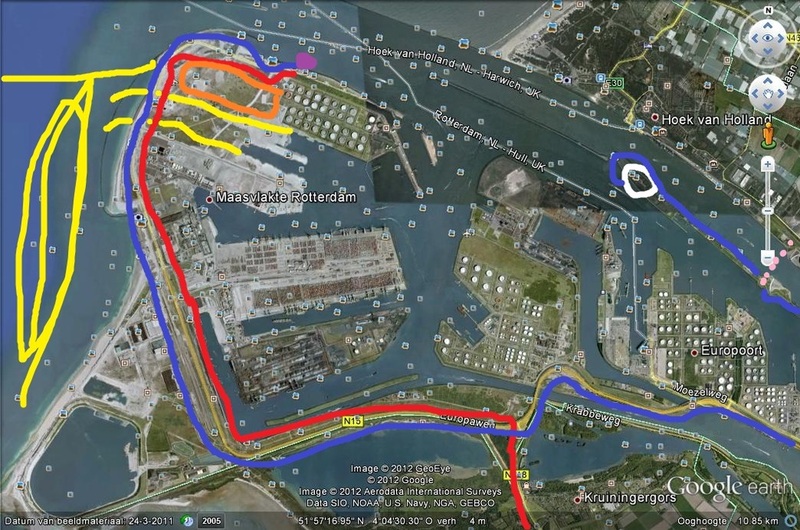 they have 6 hours to get in or out the port of Rotterdam. water is let in to the docks of the doors. if BOS (Beslis -en Ondersteunend System=decide -and support system) operate as expected,there is no rason for stress at the dicide team. for fixing a pump or cutting a cable. the closing is at a Royal Decree,it had always to go through,safety for all. it's not allowed to pass the barrier anymore for vessels. slowly are floading the doors to each other in the ''new waterway''. every door as big as the eiffeltower. after 30 minutes the doors meet eachother. the sinking begins to a special treshold at the riverbed,which when the doors get filled with water, in 1,5 hours touch. then the doors are a big wall in the ''new waterway''. the barrier gets of the piek of the floodwave. 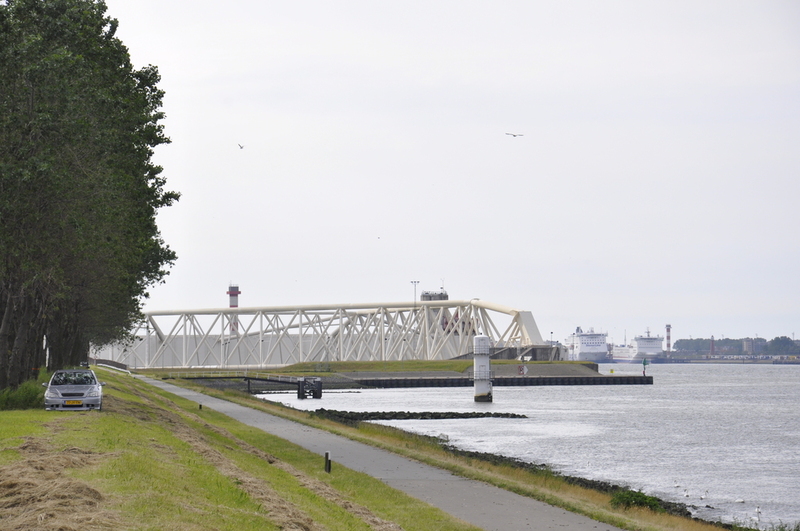 at 3 meters above NAP,the water floads over the quays in Vlaardingen and the ''noordereiland'' in Rotterdam,but the rest remains safeguarded for floods. as long as the barrier there is ,is she closed 1 time,8 november 2007 for a stormflood,the team had a call at there pieper past winter for 2 times,but they went back without closing. and by the closing of the doors is also the closing of our meetingsthread,i hope you all enjoyed it. Oh I'm so glad you posted all that,Thijs. I had not realised there was such a long procedure to go through, with measuring instruments out at sea constantly relaying information to the computers, food stores laid up for the workers who will monitor and operate the system and even having to carry bleepers during the winter season. 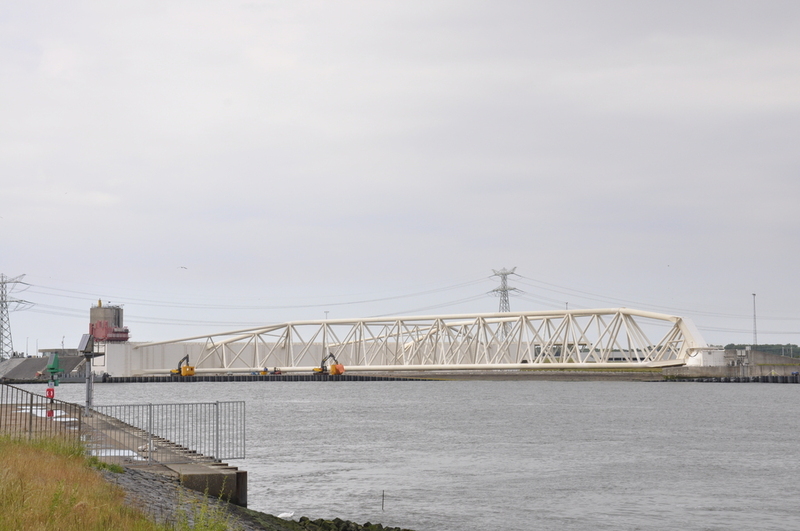 You have worked so hard to present and translate all this information on the Delta Works, Thijs, and I thank you. It is splendid. In your own words, with the closing of the doors is the closing of our thread.